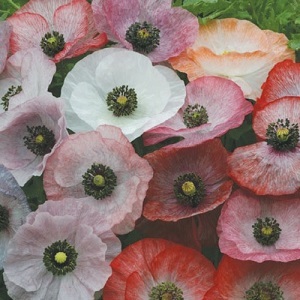 A lovely heritage variety of Field Poppy with a mix of red, pink and white grey-tinged silky flowers from June to August. These poppies grow to about 60cm in height and look good in borders, cottage gardens and wildflower gardens. Field Poppies grow best in full sun, and most unenriched cultivated soils. They will not grow well in the shade or in water logged soils. They make good cut flowers and will self-seed in the right conditions. Pack of approx 1000 seeds. Sow in autumn or spring directly in the ground or in early spring in pots, for an early start. In spring, plants generally flower about 70 days from sowing. Sowing instructions and a colour photo are printed on the packet. Sow in spring or autumn directly onto the surface of cultivated soil and rake over lightly. Sow in patterns, such as a cross or circle, so you can identify and remove weed seedlings. Thin directly sown seedlings to about 15cm apart. Or sow in early spring on the surface of plugs or cells of seed compost and keep at 15-20 degrees Celcius. Germination takes 2-3 weeks. Plant out into the garden after the last frost, disturbing the roots as little as possible. In spring, sowing to flowering is typically 70 days. Plants grow, flower and then die in the same year. Once established, plants need little care and attention. The plants form attractive seedheads after flowering, which look good on plants overwinter. 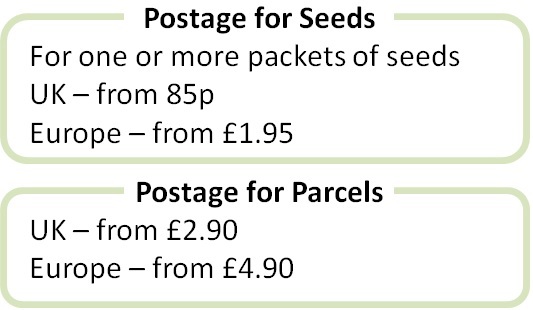 Scatter seeds into the garden in autumn/winter if you want plants to self-seed. Remove seedheads before they mature in late summer if you do not want plants to self-seed. Remove plants in autumn/winter and sow again in autumn or spring.